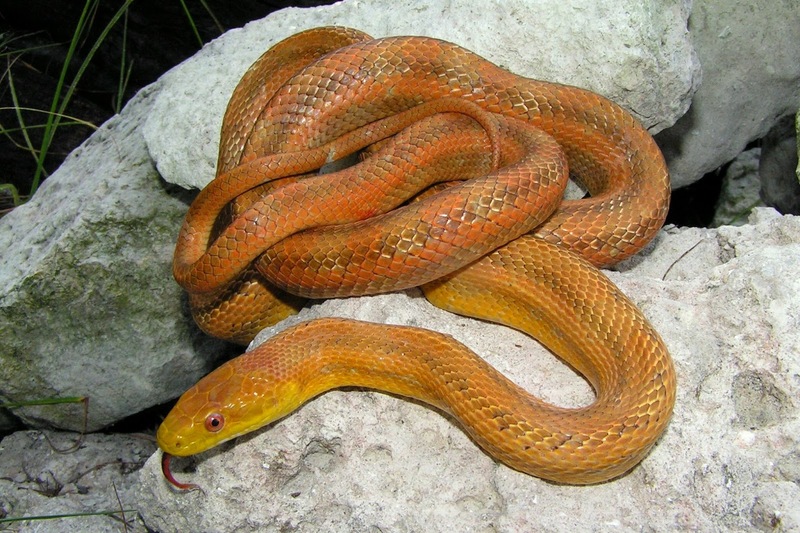 The Yellow Rat Snake is a popular choice for people that want snakes as pets. It is not so demanding, it makes little mess and he is also not pretentious when it comes to feeding. On the other hand, you will have to know how to identify this snake. Although those snakes are not venomous, they could get aggressive. It is also hard to identify a snake of this kind, as the Yellow Rat Snake looks like other common snakes. However, it is worth searching, as your pet will look beautiful in that aquarium. The Yellow Rat Snake is a common snake in America, so you could find it easily. However, finding its habitat is harder, as they prefer the deep forests and the quiet rocks where they could bathe in the sun. The rat snake also likes the vicinity of farms and barns. As its name says, the rat snake loves to feed with rats and mice. In fact, the most experienced farmers like to have at least one of those snakes around, as it will substantially diminish the populations of rodents. If you know the black rat snake, it will be easy to identify the Yellow Rat Snake also. It has the same shape, and the only difference is the color and the size. While the black rat snake is one of the largest non-venomous snakes in USA, the yellow cousin of this snake is a part of the medium sized category of snakes. 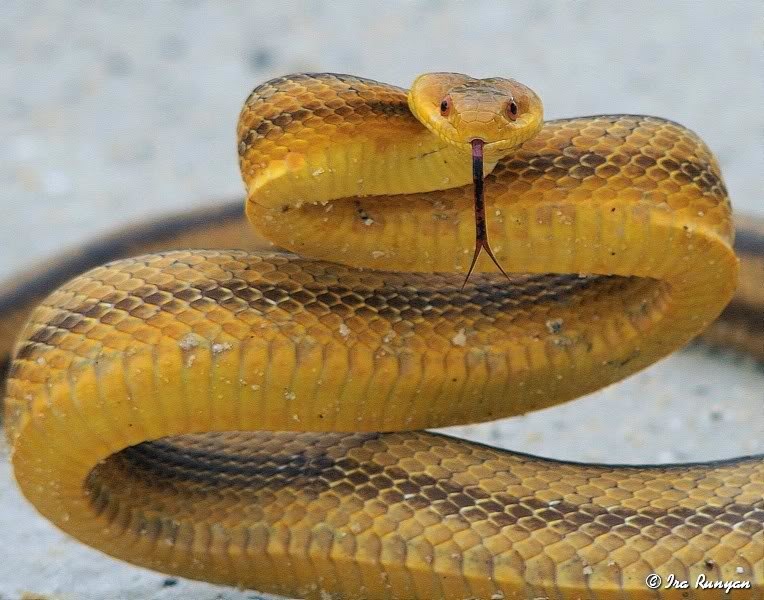 Although the name implies the yellow color, this kind of rat snake can also have other nuances, such as brown and sometimes even some green reflexes. They have four distinctive lines along their body, and usually those lines have a black color. Your Yellow Rat Snake will change its skin several times, so it will change its color as long as you own it. This is maybe the main reason for this snake to be preferred as a pet. No matter what color your snake has, the eyes have the same color as the body. There are also controversies about the taxonomy of this snake, as some specialists say that the Yellow Rat Snake is not related with the black rat, and it is more like a pine snake. Indeed, there are some resembling aspects between the yellow snake and the pine snake, but science proved that the yellow and black snakes are related and a part of the same family of snakes called the quadrivittata. 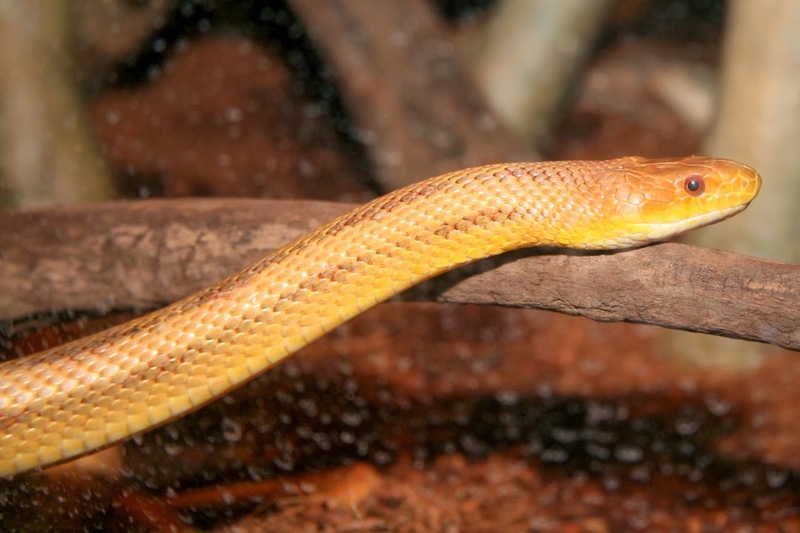 The Yellow Rat Snake needs a large aquarium of 5 feet or more length and with a height of 3.5 feet. The snake likes to climb those branches and to rest on the plain surface. You can use sand, rocks, and even leafs, but make sure the surface is not too moist. Even if the snake likes the humid environment, it is the perfect place for bacteria, and your pet might get sick. Water must also be present in the aquarium, but make sure the drinking water is placed far from the place where the snake likes to bathe.